Once upon a time, I was pretty handy with a 35mm camera, at least one as simple as my Pentax K-1000 with its easy-to-please 50mm lens. Nowadays it's a different story. My digital photography skills are horrendous, and I also have a bad habit of taking pictures with my cellphone in situations with too little or too much light. 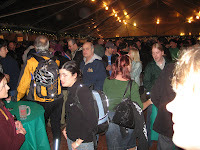 Still, I wanted to share a few pictures from Portland's 2008 Holiday Ale Fest. 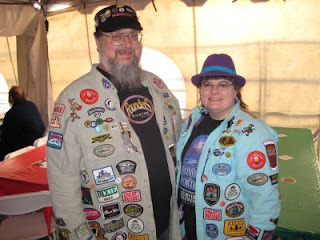 That first one is of Alabama residents Jim and Joan in their cool beer-patch jackets on Thursday afternoon. Here's a shot of the place starting to fill up Wednesday night, about 5:30. I feel bad for the guy that caught my flash right in his face. Thursday I accosted Green Dragon regular Russ to ask him what other beers at the festival to try. He showed me his Green Dragon tattoo. For some better pictures from the festival, check out this collection taken by Matt at portlandbeer.org. Matt takes some great photos, he's doing a wonderful job of documenting the Portland beer scene right now. 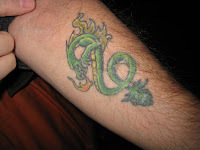 Ask Dave to show you his green dragon tattoo... oh wait, that may be inappropriate for the internet. Love the jackets. Hi Bill!